Do not make St. Patrick angry! I want to point out strongly today that not alone should we respect and love the great St. Patrick, we should also fear him. It is not just respectful to wear his shamrock and march in the parades during these special days in his honor. It is also bloody good sense and a shrewd spiritual investment in our future well-being and longevity. Any glance at the good saint's life story proves this as plain as the nose on your face or the great green bunch of shamrock on your lapel. Mark my words. Even though this is about our patron saint, I'll begin with mention of the sporting career of the late great hurling taoiseach (prime minister) from Cork, Jack Lynch. Before he was his country's leader (in the footsteps of St. Patrick?) Lynch was one of the best hurlers of all time. He led Cork to a stack of All-Ireland triumphs with great style and skill. And here is the connection. Lynch was one hardy big man, but he wore a far more gentle face than that presented to the pagan Irish by St. Patrick. Furthermore, his record on the hurling field proved that he was one of the cleanest and most elegant players of his generation. Opposition players, trying to subdue him, often used means that were foul rather than fair. They gave him what is called timber in the code. And do you know what happened to them before the game was over? Jack Lynch was never seen to pull a foul stroke against any opponent, no matter what punishment was dished out to him but, dammit, the sporting records of hurling show that most of his foulers were injured and had to commonly be carried off the field inside the next 10 or 15 minutes. 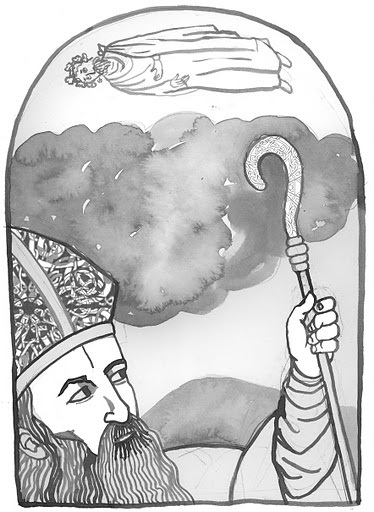 And the great St. Patrick operated like that too. That is why it is prudent to never disrespect either him or his shamrock. His record, like that of Jack Lynch, speaks for itself. Anybody who ever attempted to stand against him in his drive to convert us from pagans to Christians very quickly came to a bad end, often extremely grisly and horrific. We should always remember that, especially on St. Patrick's Day. It is true that the extremely florid and highly ornamented language used centuries ago to relate his story creates a linguistic thicket behind which it is difficult to ferret out the hard facts. But they are all there somewhere in documents which have been proven to be authentic records of his life and times. I did just a little research last weekend and can stand over the facts I'm about to relate. And, just like the Old Testament itself, there is some fairly blood-curdling stuff attached to Patrick's conversion of Ireland from 466 onwards. Mind you, since he had served and survived his slave years on Slemish under a cruel master, it can also be taken for granted that he was a tough man too, hardy as any of the goats and sheep he tended. Otherwise he would not have survived his ordeal and managed to escape. You know all about his triumphant mass conversion of the kings and princes and nobility of Ireland that March day at the Hill of Tara. That is well documented. But did ye also know that during those days all the powerful Druids whose influence he was threatening were also there, close to the kings at the beginning, using all their dark powers against him. And they had great powers also -- call it Celtic Hoodoo. Do ye know that they caused the Hill of Tara to be covered by a dense black cloud just when Patrick was getting into his stride? Patrick challenged them to get rid of the cloud. When they were unable to do so he raised his mighty crozier towards the sky, and almost instantly the bright sun broke through. More to the point (and there is, as always, no suggestion Patrick was directly involved) what happened within the hour was that the High Druid, a powerful character called Lochru, was suddenly levitated high into the air, his great belly hanging down below him, and was then dashed down on the rocks and effectively converted into jelly! It is all there in the annals in black and white. See now why I remember Jack Lynch? There are many other examples of sudden ends befalling Patrick's foes. I'll relate just one more. Where did Patrick not head for after his success at Tara but straight as a gun ball for Milchu's castle outside Ballymena. I presume it was the good saint's wish to convert Milchu. That is what the ancient documents suggest, of course. His roars of agony could be heard 15 miles away before he expired. That story is there too in black and white. I think I have proved the point. It is better at every level to love and honor our mighty patron saint, wherever you are in the world, than to transmit even the slightest hint of negative feelings. So go to Mass, if that way inclined, march in the parade, wear the shamrock and ritually drown it with your countrymen before the day is over. It is great craic -- as well as being good insurance for your future. Accordingly, I wish all of you a safe and happy St. Patrick's Day.